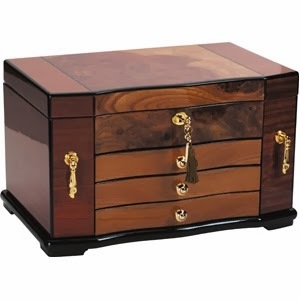 ChasingTreasure.com Jewelry Boxes Blog: Christmas is Just Around the Corner - Why Not a Luxury Jewelry Box? Christmas is Just Around the Corner - Why Not a Luxury Jewelry Box? As we move closer to Christmas, it’s time to look past the Halloween candy displays and start seriously thinking about Christmas gifts for your spouse. If you’ve been married for any length of time, you probably have reached a point where you’ve exhausted your gift ideas and you spend a great deal of time trying to think of something new. Whether for a man or a woman, a luxury jewelry case can be just the right item: unique, beautiful, and providing a wonderful combination of ascetic luxury with every day practicality. So what constitutes luxury and why pay more for a luxury jewelry box; aren’t they all basically the same? Well, yes, in the sense that a Yugo is basically the same as a Porsche: they both have engines, tires, a steering wheel, and are mainly made of metal. What makes one jewelry case more luxurious than another? Similar to our automobile comparison, it gets down to the quality of material, craftsmanship, and time spent on attention to detail. Quality of material is the most obvious: the color of the wood (bubinga or deep cherry for example), the finish (highly polished, but oftentimes distressed if that is the overall style), and the padding under the felt-lining are the most obvious. The hardware such as hinges and knobs also make the jewelry case stand out. Craftsmanship is equally important, as this will be the main driver of how long the jewelry box lasts without needing any upkeep or repair. Fastening hinges and knobs with screws as opposed to nails means they won’t become loose, and ensuring the dovetailing of wooden connections with tight tolerance fits means the box won’t eventually wobble around those connections. Extra padding along high wear areas, and tight-fitting gliders for the drawers will guard against the areas that receive high repetition use, such as removing popular rings and opening/closing certain drawers. Finally, attention to detail can be a critical aspect of the asthetics. Since luxury jewelry boxes are hand-made, matching wood grain can be compared to matching animal skins for high-end boots, coats, or handbags. And distressing the wood is an art in inself: too much and the piece looks old and beat-up, too little and it just looks scratched and mistreated. The perfect amount will make the piece look like an heirloom, handed down from generation to generation, which ultimately is what you’re looking for. In closing, a luxury jewelry case can be a great answer to “what do I get my spouse for Christmas this year?”!